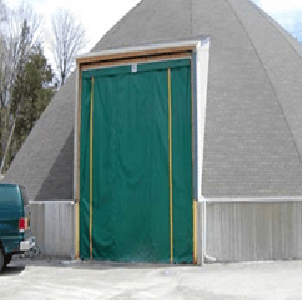 Door Construction – Doors are constructed from double coated tear resistant vinyl coated nylon. Standard feature includes break away wind bars with automatic reset, replaceable aluminum track and a full width PVC viewing window. 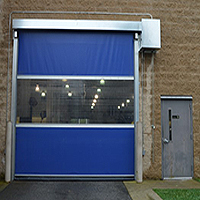 Paylon commercial roll up doors offer an economical solution For room separation From temperature loss, dust and noise control while allowing easy access for foot, cart and motorized traffic. Each door is custom fit to your specific application. Available with remote control or motion sensors. All our commercial vinyl roll-up doors come as a complete kit, custom made for your application. The doors are easy to install and are designed to give many years trouble free operation. 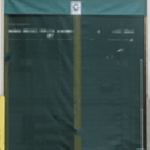 The commercial vinyl roll up doors can be either header or face of wall mounted and come with all the necessary parts for a complete installation. 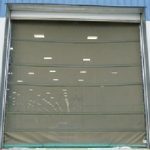 Roll up vinyl doors are constructed with high-grade materials with few moving parts. This will ensure easy installation and provide many years of trouble free service. All main components are easy to replace. 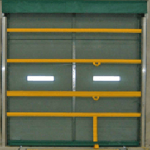 Depending on your application we offer 2 types of electric roll up vinyl doors (Standard duty or high cycle).